Prolinx employees recently volunteered their time at Chimney Meadows Nature Reserve, near Bampton with Berkshire, Buckingham & Oxfordshire Wildlife Trust (BBOWT). The Trust is part of a movement across the UK made up of 47 different Wildlife Trusts caring for more than 2,000 nature reserves, including meadows, woodlands and parks. They are supported by 800,000 members and thousands of volunteers. 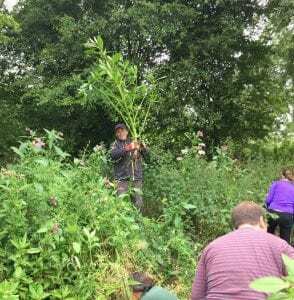 We took two groups to the reserve over two days to help clear the invasive plant, Himalayan Balsam, which takes over river banks and prevents native plants coming through. Complete with gardening gloves and loppers, the groups set to work, clearing as much of the shrub as possible. The first day, temperatures were at 33°C but the team persevered despite the heat, much to the surprise of the BBOWT staff! The weather was kinder to us on the second day and team two covered a much thicker patch of the balsam, dodging nettles, horseflies and sinking mud! We very much enjoyed the days and, despite the bites, stings and weather, everyone finished with smiles on their faces. If you are interested in the work of BBOWT, find out more on their website.